his series will either be the making or the ruination of me. Lately Ive been following your Argonotes, in which several gentlemen have taken several of us poor writers for a ride. I anticipate a lot of copy for that section with these hazardous occupation stories judging from the diversity of opinions I have received in collecting the material. 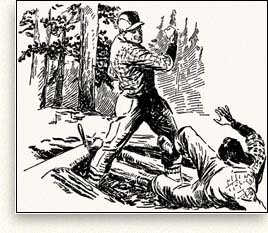 For instance, two loggers I was talking to last month almost came to blows over the right name for the lad who strings cables in the lumber camps. One claimed it was high-rigger; the other, high-faller. According to location, I suppose. Mining is another thing that varies to beat the devil. All depends upon district, whether coal or metal mining, whether you are a miner or a mining engineer. Oil wells are the most variable thing in the lot. Every section of the world has a different nomenclature, different methods. I took Texas because Im familiar with their methods there, but ten to one some roughneck in California is going to pop up with vast objections. So, I anticipate lots of fun. All along Ive realized the score on this and so I have checked and rechecked the data contained in the stories and I think Ive got an airtight answer for every possible squawk. Something else has amused me considerably. Writers, treating the same subject time after time in fiction, gradually evolve a terminology and a pattern for certain types of stories as you well know. This creates an erroneous belief in readers that they are familiar with a certain subject through reading so much fiction dealing with it. Ive had to shed a lot of that for the sake of accuracy and Im very, very anxious to have my hand called on some of it.